The current generation of children and youth are fact-oriented and need substantiation and justification to develop belief in anything. Their belief system, unlike that of the yester year generations, is based on scientific reasoning. They require a scientific description to be convinced. To inculcate and foster belief in them in the age-old astrological science, Viswanathasaraswathi first counsels them appropriately as part of building up their confidence and self- esteem. His methodical approach towards providing a scientific explanation to their state of affairs and recommending reliefs or steps for improvement find favour with vast multitude of people. There are many youngsters who work very hard but are unable to reap good results due to a variety of reasons. Lack of proper guidance at crucial times of life is one of them. Viswanthasaraswathi guruji, an empathetic listener that he is, provides the much-needed counselling to such individuals to make their life journey a smooth and enjoyable one. This he achieves by an effective mix of his remarkable knowledge of Astrology and real time interpretation of it. According to the science of Astrology, the events in the meta physical world are dependent on the activity of celestial bodies. Arga- jataka or financial astrology, is that branch of Astrology which relates and establishes the link between the activity of the celestial bodies and the financial markets in the society. Millions of people fall into huge debts because of the ignorance of this proven relation. Financial Astrology provides the answers in preventing such eventualities and save people from regretting their fate. Viswanatha Saraswathi guides them according to their astrological condition and helps them identify the probable fields or vocations for their success. Maharishi Brighu, one of the Saptarishis, is the originator of predictive astrology. He painstakingly compiled and composed Brighu Samhitha, the science of astrology, by virtue of his intense spirituality, acquired from his rigorous penance. This science, the Hindu Astrology, which is being referred as Vedic Astrology in recent times, lays down in clear terms the direct bearing that heavenly bodies have on events in the world. A thorough understanding of this branch of knowledge enables one to predict future events based on scientific calculations. Medical Astrology, a part of Vedic astrology, helps an experienced and learned Astrologer to see what disease the native is suffering from or is likely to suffer from. The Astrologer need not be a medical expert or for that matter he may not be able to name the disease in particular. But the Astrologer can certainly pin point what system or organ of the human body is vulnerable or is likely to be affected seriously. The present-day trend of life patterns and food habits among people are resulting in chronic as well as new and yet unidentified forms of illnesses and diseases. In most cases, symptoms of these diseases do not manifest until the last stage, making treatment difficult and unhelpful for recovery. Sri Viswanatha Saraswathi, an ardent devotee of Goddess Saraswathi and Lord Dattatreya, has forayed into this unique and scientific realm of astrological predictions with commitment and with a burning desire to help people lead healthy and prosperous life. The Divinely blessed Viswantha saraswathi has embarked and completed a temple of Goddess Saraswathi at Ganaghapur, Karnataka on the banks of confluence of Amaraja-Bheema rivers within a short span of 108 days. 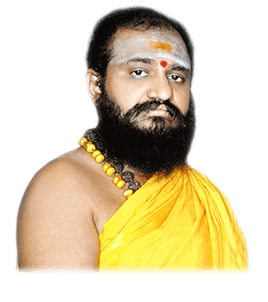 The devout and pious Viswanatha Saraswathi astrologer devotes a large chunk of his time selflessly to several holy and sacred programs for the welfare of the society.